Your routine for cleaning your teeth is an active form of defense against the ills of bacteria growth. Always present in your mouth, bacteria search for leftover food to cling to and absorb for nutrients. When they feed, the bacteria grow, and they form clusters called plaque. If allowed to fester, plaque can eventually lead to tooth decay and gum disease. By removing food particles and cleaning the teeth properly, the latter predicaments can be avoided. 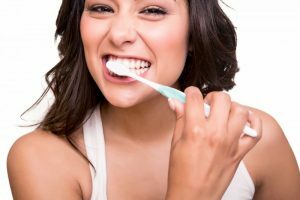 What are the Basics of Oral Hygiene? Brush After Every Meal – When you brush your teeth after eating, you greatly limit the chance of bacteria growth and by using a toothpaste fortified with fluoride, you provide your teeth with added protection. If you can’t brush after every meal, then at least do so when you awaken and before you retire for bed. The Importance of Flossing – Using dental floss is just as important as brushing your teeth because it cleans in the tight crevasses that can’t be reached with your toothbrush, which is key for preventing conditions like gum disease. Keep Mouthwash Handy – While rinsing with mouthwash can’t replace either brushing or flossing, it plays a vital supportive role. By bathing your mouth after a meal, it helps to remove leftover debris that could contribute to tooth decay and gum disease. When you clean your teeth, you aren’t just protecting your oral health, you are also enhancing your overall wellness. This is because acute bacteria growth in the mouth doesn’t just remain local. Once it penetrates the gums, it can travel through the blood to other parts of the body. Thus, a condition like advanced gum disease – which is encouraged by poor oral hygiene – can cause infected blood to be transported to the brain, heart, lungs, pancreas and other parts of the body. This can leave patients vulnerable to serious conditions like Alzheimer’s disease, heart attack and pancreatic cancer. Your efforts to better clean your mouth, teeth and gums will help in protecting you from such undesired circumstances. Along with practicing excellent oral hygiene, you should be sure to visit your dentist for six-month care for a cleaning and check-up. The professional will also be able to spot any early warning signs of a development so you can nip it in the bud and be fully restored to excellent oral health. Better yet, these visits will help you maximize your dental insurance, which is important given the end of the year is rapidly approaching, which means your benefits will soon renew. So to take a stand for your oral and overall health, make a pledge to practice better oral hygiene, and be sure to reach out to your local dentist to schedule a visit before the year ends! Dr. John T. Michaels is a graduate of The Ohio State University, where he earned his Doctor of Dental Surgery degree. Throughout his career, he has remained dedicated to expanding his knowledge, which is why he has taken over 1000 hours of continued education in a host of areas. Dr. Michaels practices at Norwood Dental Care, which has been named the best practice for the past 14 years, and he can be reached for more information through his website.